For a few years in the mid-1990s, the Yankees had a revolving door at second base. Pat Kelly mostly held the position down from 1992-95 before getting hurt and giving way to Mariano Duncan in 1996. Duncan, Kelly, and Luis Sojo took turns at the position in 1997. That’s three primary second basemen in three years. The Yankees were a good enough team overall to overcome the second base revolving door. They won the World Series in 1996 — thanks in part to Duncan’s inexplicably excellent season — and won 96 games in 1997. And yet, going into the 1997-98 offseason, the Yankees were in obvious need of a second base upgrade. They also wanted a set leadoff hitter so Derek Jeter and his bat control could hit second. Meanwhile, up in the Minnesota, the Twins were dealing with a second base problem of their own. They had a franchise caliber player at the position in Chuck Knoblauch — Knoblauch hit .319/.413/.468 (127 OPS+) and averaged ten homers and 47 steals per season from 1994-97 — but he wanted out. Bad. He demanded a trade publicly and backed the team into a corner. Knoblauch signed a five-year extension worth $30M in November 1996, and after the club floundered in 1997 (79-83), he wanted out. “I was just dejected. The losing got to me. I wasn’t handling getting beat up on a pretty consistent basis,” Knoblauch said to Amelia Rayno in 2014. The Yankees needed a second baseman and a pretty great second baseman had just demanded trade. It was a perfect fit. Knoblauch and the Yankees were a match made in baseball heaven, yet trade talks dragged on for weeks and months, so much so that then GM Bob Watson suggested the Yankees could go into the season with Sojo and Rey Sanchez at second base. The Indians were in on Knoblauch as well, so the Yankees had competition. The Twins, even though Knoblauch demanded a trade and had long been a clubhouse headache, had a high asking price. Bernie Williams was involved in trade rumors at one point. Mostly though, Minnesota focused on prospects like lefty Eric Milton, catcher Jorge Posada, and outfielder Ricky Ledee. They wanted first baseman Sean Casey from Cleveland. It wasn’t until February 6th, three days after Brian Cashman replaced Watson as GM and not long before the Yankees opened Spring Training, that the Yankees and Twins came to a trade agreement. Knoblauch went to New York for Milton, shortstop Cristian Guzman, outfielder Brian Buchanan, righty Danny Moto, and $3M in cash. It was a blockbuster. Knoblauch was a star and Milton and Guzman were top prospects. With Knoblauch at second base, Joe Torre’s lineup seemed to write itself. Everyone fell right into place. The pieces just fit. Knoblauch, however, had trouble with the adjustment to New York. He had a four-hit game in the second game of the season, but on May 17th, his batting line was .238/.346/.318. It was .246/.358/.371 on August 1st. Knoblauch was expected to bring a high batting average and on-base percentage, and steals. Instead, his average and on-base percentage sank, and he went from 62 steals in 1997 to 31 steals in 1998. Because he had been traded in the middle of a multiyear contract, the Collective Bargaining Agreement allowed Knoblauch to request a trade after the 1998 season. The Yankees discussed a contract extension with him earlier in the year to prevent that from happening, but talks were tabled. There were even rumors of a Knoblauch-for-Roberto Alomar trade at midseason. The Yankees were, of course, completely dominant all summer — at one point they won 91 of 117 games, if you can believe that — so Knoblauch’s less than stellar production wasn’t dragging the team down. Neither was his suddenly shaky throwing. The potential for a trade demand — or the potential to leverage that trade demand into an extension — was a bit of a headache, though not much. Knoblauch finished the regular season strong, hitting .303/.369/.471 with seven homers in his final 51 games, giving him a .265/.361/.405 (102 OPS+) batting line overall. He set a new career high with 17 homers, walked more than he struck out (76 to 70), and also led the league with 18 hit-by-pitches. Not awful. Not great, not Knoblauch with the Twins, but not awful. As the Yankees marched to the 1998 World Series title, they did it in spite of Knoblauch, not with his help. He went 1-for-11 (.091) during the team’s three-game sweep over the Rangers in the ALDS. In the ALCS, Knoblauch made what is one of the most infamous plays in recent Yankee history, as he let two runs score while arguing with the umpire in the 12th inning of Game Two against the Indians.
? Knoblauch argued Travis Fryman interfered with the play by running outside the basepath and on the infield grass. He argued, and he continued arguing, and he arguing some more as Enrique Wilson chugged all the way around from first base to score on the play. Knoblauch was booed when he came to the plate in the next half-inning, and the Indians eventually held on to knot the series up at a game apiece. The Yankees rallied to win the ALCS and, in the World Series, Knoblauch atoned for the boneheaded mistake against the Indians — I’ll never forget the “BLAUCH HEAD” headlines in the papers the next morning — with a game-tying three-run home in the seventh inning of Game One against Donne Wall and the Padres. Knoblauch was great in the World Series that year — he went 6-for-16 (.375) with the home run, three walks, and two strikeouts in the four-game sweep — so, in that sense, it was mission accomplished. The Yankees won the World Series! That’s the ultimate goal. The Yankees acquired Knoblauch to solidify second base and raise hell atop the lineup. He did neither. He had some defensive issues and his offense was not up to his career standards. That was true in 1998 and in subsequent years as well. The throwing issues got worse and the offensive numbers trended down. 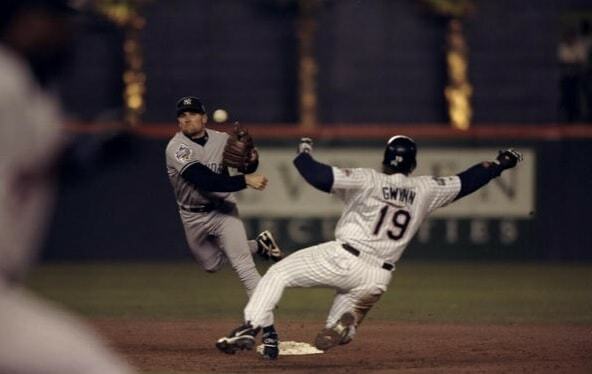 Knoblauch had some big moments from 1999-2001 — his game-tying two-run home run in the eighth inning of Game Three of the 1999 World Series comes to mind — but he came to New York as one of the game’s premier second basemen, and left as a left fielder the Yankees tried to unload every winter and every trade deadline. The Yankees figure to be prominent players on the free agent market every offseason, however they threw us a changeup this winter and instead pulled off two major trades while committing no more than one year to any free agent. Curtis Granderson steps into the outfield for the next few seasons, and even though Javy Vazquez is only signed through 2010, it has to be considered a major move just in terms of how valuable he could be. The cost in both trades was the same: three young players with several years of cost control ahead of them. Twelve years earlier, the Yanks made a similar trade, one that turned a weakness into a strength at the cost of minor league depth. After watching their second basemen hit .282-.331-.362 with just five homers in 1997, the worst production the team received from any position besides catcher, rookie GM Brian Cashman acquired All Star second baseman Chuck Knoblauch from the Twins. Cashman had succeeded Bob Watson as the team’s general manager just five days before the trade was completed, so he wasted no time making a big splash. At the time of the trade, none of the four players the Twins received had yet to appear in the majors, while Knoblauch was coming off a four year stretch in which he hit .319-.413-.468 with 188 stolen bases while making four All Star appearances. His 127 OPS+ during those four years was higher than Roberto Alomar’s (124). The trade gave the Yanks a veteran lead off hitter, pushing young phenom Derek Jeter down to what would become his customary two-hole. Milton, the Yanks’ first round pick in 1996 and then just 21-years-old, had split 1997 between High-A Tampa and Double-A Norwich, posting a 3.11 ERA with a 162-50 K/BB ratio in 28 starts and 171 innings. Yeah, things were different back then, innings limits weren’t exactly a top priority. Minnesota sent him straight to the big leagues in 1998, and he responded by posting a 5.64 ERA with a 107-70 K/BB ratio in 32 starts and 172.1 IP. He would go on to no-hit the Angels the next season, and in the end he became a fixture in the Twins’ rotation until 2002, posting a dead even 100 ERA+ in 162 starts and close to 1,000 innings along the way. Knee issues limited Milton to just three starts in 2003, and with free agency just a year away, Minnesota shipped him to the Phillies for Carlos Silva, Nick Punto, and a player to be named later. As you can imagine, Milton provided the Twins with a great deal of value as a league average innings eater. All told, he was worth 13.2 wins over a replacement player during his time in the land of 10,000 lakes. Guzman, just 19 at the time, had hit .273-.310-.354 with 23 steals mostly with Low-A Greensboro the year before the trade. He spent his first season in the Twins’ organization playing in Double-A, hitting .277-.304-.352 with another 23 steals. Minnesota jumped him to the big leagues in 1999, though he struggled greatly and hit just .226-.267-.276 with nine steals. Guzman improved a bit the next year, and in the long run he hit .266-.303-.382 with 102 steals in six years with the Twins. He thrice led the league in triples, and even appeared in an All-Star game. The lure of a free agent payday (four years, $16.8M from the Nationals) spelled the end of Guzman’s time with Minnesota, though he gave the team 3.9 wins over replacement total. Buchanan, another former first round pick by the Yanks (1994), had developed into a minor league slugger with good but not great numbers. He toiled away in Triple-A for a few years after the trade, seeing big league action in parts of three seasons for the Twins before being traded to the Padres during the 2002 season for a light hitting A-ball shortstop by the name of Jason Bartlett. Buchanan hit .258-.319-.428 in 455 plate appearances for Minnesota, providing just one-tenth of a win above a replacement player. Mota, a 21-year-old righty that had spent parts of three seasons in the Short Season NY-Penn League prior to the trade, steadily climbed the ladder and ultimately contributed just 5.1 IP of 8.44 ERA ball to the big league team. He was out of affiliated baseball by 2002, contributing a whopping one-tenth of a win below replacement level to the Twins cause. As for Knoblauch, he parked himself atop the Yanks’ batting order for four seasons, though he never quite produced at the levels he had in Minnesota. He hit .265-.361-.405 with 31 steals and a then-career high 17 homers in 1998, however he was perhaps best remembered for the “Blauch-head” play against the Indians in the ALCS, when he stood around arguing with an umpire rather than picking up a ball in play, allowing Cleveland to take the lead in extra innings. Knoblauch went on to hit a game-tying three-run homer in Game One of the World Series, helping the Yanks to a sweep of the Padres and a World Championship. With a season in pinstripes under his belt, Knoblauch rebounded to hit .292-.393-.454 with 28 steals and a career high 18 homers in 1999, helping the Yanks to another World Title thanks to a .283-.353-.391 postseason performance. However, he began having issues with this throwing, leading to a career high 23 errors. Knoblauch missed time with injury in 2000, and his throwing problems became so severe that he spent significant time as a designated hitter. Nevertheless, he hit .283-.366-.385 as the Yankees captured their third straight World Championship. Knoblauch, unable to overcome his issues throwing to first base, moved to left field permanently in 2001, and he hit just .250-.339-.351, the worst offensive showing of his career to that point. In the four years since he was acquired, Knoblauch went from an elite hitter at a premium position to a below average hitter in a corner outfield spot. The Yankees let him walk as a free agent after the season, and Knoblauch was out of baseball by 2003. During his four seasons in pinstripes, Knoblauch contributed just 6.6 wins above a replacement level player to the Yankees cause. Let’s round up the WAR data in a nice, easy to read table. The Twins quartet provided their team with a combined 17.1 wins above replacement, mostly thanks to Milton obviously. That doesn’t include the contributions they got from Silva, Punto, and Bartlett, but we can’t count that against the Yanks here because Minnesota might have made those trades anyway, just with different players. While the Twins got the better end of the on-the-field production here – and there’s no denying that – the Yankees did win four pennants and three World Series with Knoblauch in the lineup every day. Unlike say the Brewers and CC Sabathia, the Yanks didn’t forfeit a significant part of the future for just one playoff appearance here. In the end, this trade was a classic win-win. The Twins got exactly what they were looking for, two legitimate big leaguers and a little extra, while the Yankees got what they wanted in the form of championships. Minnesota’s reward is easily measured in WAR, but Knoblauch was a part of a dynasty in New York, and it’s impossible to put a number on that. Hindsight is 20-20, and I’d bet that both sides would do this deal again 100 times out of 100. I bet this isn’t what Bud Selig and George Mitchell had in mind when the Mitchell Report hit the streets in December. After nearly two months of back-and-forth posturing in the press and the halls of Congress, it’s come down to two men. Only Brian McNamee and his one-time client and current arch-rival Roger Clemens will testify in front of the House Oversight Committee on Wednesday. According to numerous reports, Andy Pettitte did not want to testify in public against Roger Clemens, and the committee was satisfied with the deposition testimony it received from Chuck Knoblach and Kurt Radomski, the other New York-based trainer named in the Report. Somewhere, Paul Lo Duca just breathed a giant sigh of relief. In related news, Jim Baumbach and Robert E. Kessler of Newsday reported that Pettitte’s testimony confirms McNamee’s story and contradicts Clemens’ vehement denials. For Clemens, this will be utterly devastating, and Andy Pettitte, who has long idolized and respected Roger, must not feel too great about the current situation. From a Yankee perspective, this circus is either ending or just starting. For better or worse, Roger Clemens is now forever linked to the Yankees because of the Mitchell Report fallout and the time of his supposed drug use, the bulk of which is reported to have occurred during his time in the Bronx. If Pettitte’s testimony, part of the public record, shows Clemens’ recent denials to be a façade, the media circus will swarm around Tampa next week like no other. If not, this strange tale of drugs, syringes and gauze will play out in Congress. For Clemens, this news on the eve of the hearing cannot be good. On Wednesday, two men — one player out of the 89 named in the report — and one trainer will face down a Congressional committee annoyed by the way this drama has played out. One of them will emerge from the committee room most likely the subject of a perjury inquiry and a disgraced man. I wonder what odds Protrade would give on that one. Finally, there’s always Bud Selig standing in the corner. With this latest development, the Mitchell Report and its original intentions have been launched out the window. No longer is this about stopping steroids in baseball. No longer is that incomplete document that randomly named 89 out of what has to be hundreds of drug users the focus of attention. Rather, it is about only the biggest name in the document and the saga that has played itself out on TV stations and newspapers across the country. It’s about a recorded phone call, eight-year-old syringes and gauze, spousal accusations and firm denials. Somehow, I bet this isn’t what Bud Selig envisioned three years ago when he commissioned the report, and I bet it’s not what he envisioned when he released this document to the wolves two months ago. A Mitchell Report without names would have served its purpose better than this document, and as the charade continues tomorrow, I have to wonder whether or not this whole thing — this report, this committee hearing, this attention to something that no one can change — is really in the best interest of baseball. As of Friday afternoon, federal marshals still hadn’t been able to serve Chuck Knoblauch his subpoena. Knoblauch is due to testify in front of Congress on Tuesday and was originally subpoenaed this Tuesday. For what it’s worth, Chuck’s mom thinks that he’ll show up on Tuesday. I still can’t quite figure out why Chuck Knoblauch, of all the people named in the report, is getting picked on by our elected officials. To follow up on what is quickly turning out to be one of the stranger stories of the Winter of Our Steroidal Discontent, Duff Wilson of The Times reports that, as of Thursday afternoon, Chuck Knoblauch had still not been found. Therefore, he has not yet been served his subpoena. To call this weird would be an understatement. Unsurprisingly, Chuck Knoblauch, a very private individual who wants to put baseball behind him, declined Congress’ invitation to appear in Washington next month. So the bullies in DC subpoenaed him instead. One way or another, Chuck will be in Washington making a rare public appearance since the end of his playing days. I wonder what he’ll have to say. 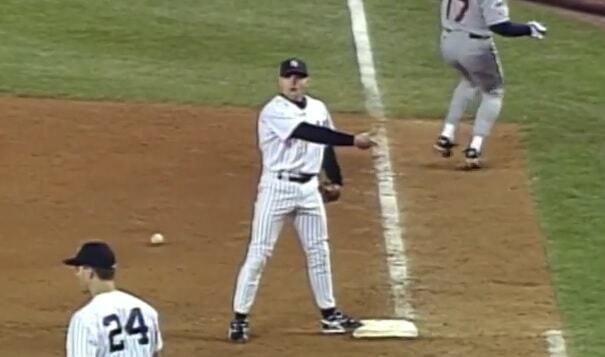 Where have you gone, Chuck Knoblauch? Of all the names in the Mitchell Report, two of the bigger stars named have remained fairly silent. Until today, no one had heard neither hide nor hair from Paul LoDuca or Chuck Knoblauch. But that changed when Knoblauch spokes to a Times reporter at his home in Houston. So that’s that. Believe what you want about Knoblauch. More compelling are the indications that baseball still haunts. Chuck Knoblauch’s story in baseball had a sad ending. An offensive lynch pin on the Yankees for two seasons, he was seemingly destined for 3000 hits when in 2000, his third year in the Bronx but his second with throwing problems, he simply lost it. Suffering a meltdown that Rick Ankiel would imitate in 2001, Knoblauch simply could not throw the ball from second base to first base. The Yankees tried to keep him around. He tried left field for a bit in 2001 and still managed to rack up 600 plate appearances. But his offensive production that season was abysmal. A 1-for-18 showing in the 2001 World Series punched his ticket out of New York. He would try to latch on with the Royals in 2002 and was out of baseball the following year. A promising career had been derailed by mental demons. “I’ve got nothing to do with any of that, I mean, any baseball. And I don’t want anything to do with baseball,” he said to Evans. Knoblauch doesn’t want a job in baseball; he doesn’t want a spot in the Hall of Fame; and as he asked the reporter not to tell anyone where he lives, he doesn’t want to be bothered. It’s sad really to see someone who was among the tops at his position fall so hard and so far so quickly.